One of my favorite books in the world is Systemantics, by John Gall. This irreverent look at systems and how they fail has a lot to teach a community that is attempting to re-work the systems of software development. 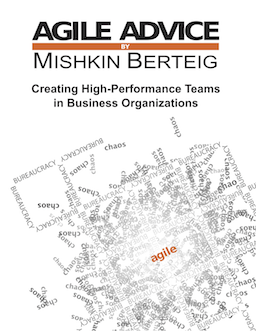 Much of it justifies the “simple set of principles, applied” approach that most Agile methods use. It should also provide good insights into anyone trying to develop and architect complex software systems. The best kind of parody is one that’s hard to tell if it’s parody, because it’s so insightful. The book is available from the author at the Systems Bible page. Bell Canada is traffic shaping to restrict the speed of data on P2P networks.Â Mark Kuznicki has written a good reference piece on his blog.Â The piece is titled Bell Canada Hands Net Neutrality Advocates a Gift.Â It’s sad but funny too.Â I don’t usually post non-agile items, but I thought this one deserved some attention.Â Please, if this is important to you, take the time to blog about it even if just to link to Mark’s article.Â We’re using the tags: bellthrottling, netneutrality, canada. For the last 3 months I have been lucky to work with tools and in an environment that is agile. My job requires lots of small projects and tasks and my job title is clear but my work is every changing. I like new challenges and creative tasks. Recently our small team has been using http://cardmeeting.com/ an online tool to add ideas, set up tasks, and keep track of what the whole is doing and what still needs to be done. I am looking for more tools to make our agile practices more streamlined and efficient. Any suggestions or ideas? This article called “To Bet Or Not To Bet: How The Brain Learns To Estimate Risk” is interesting, particularly because agile methods treat risk completely differently than traditional methods.